One important thing to send in Operation Christmas Child shoeboxes is school supplies. One thing we always like to include with that, is lined paper. One of the most cost effective and substantial ways to include that is with a spiral notebook. There's even a great story about recipients and their notebooks: Shanika & Sherika -and- the Notebooks. However...it can be hard to figure out how to make them fit, but once you know the trick, it's pretty easy. There are actually two schools of thought. If I do this, I always try to put something in the corner to use up that little space. Personally I slide it in the back along the lid. Often this is easiest to do after packing the shoebox. This also works great with full sized coloring books! One hint I've learned is whichever way you do it, always have the open end up...it can bend better if unattached sides of the pages are the part that is bending. 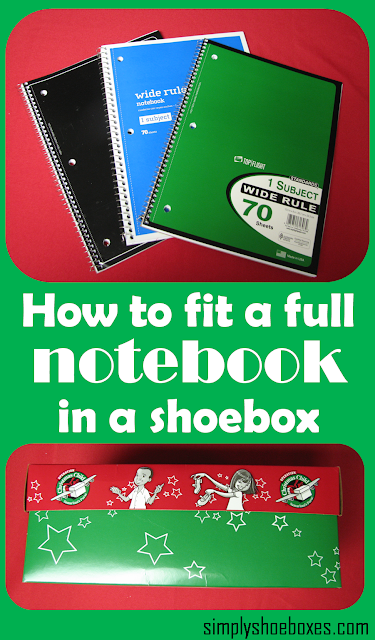 This is just one of a series of posts on how to make it fit in an Operation Christmas Child shoebox. Follow that link to view them all. I use option 2 and they always fit. Notebook goes in all my boxes age 2-14. I like to use a steno pad which fits oerfectly!!! Start with that in the bottom. Thanks for this great advice! I've never included notebooks in our shoeboxes because I assumed they wouldn't fit. I'll give it a try! We were so lucky this year to see the Big Lots sale on spiral notebooks, $.17 each. Ran around to different stores until we had our 500 for our packing party. Remember, some stores will match prices. I use option one for notebooks and coloring books. This works great for me. I have done both of these suggestions and they work fine. I have also cut the back off of the spiral and then roll the rest of it into a tube and secure with a ponytail holder or rubber band. Happy Packing! I always use a either a steno pad or 3 pack of small legal pads-sorry but I want everything not to be damaged in any way when the child gets the box. Thanks for sharing your thoughts/ideas. The reason I prefer a full sized notebook most the time is #1 amount of paper, #2 possibility it may be required for school, #3 cost which allows me to pack more in a shoebox, or more shoeboxes in general. And I've found at worst it's a little winkled. But all lined paper is great! Check Staples this week for sales on paper/notebooks. Target had some school supplies at reduced prices last week. I don't know if it was a clearance event or if the reduced prices will carry over to this week. Some stores in my area have reduced prices on school items in July - sort of a "shop early now and avoid the crowd" type thing. I have found reduced prices on kids' scissors, glue sticks, crayons, and notebooks. Also good to get some and set aside for donating to local schools. At our local bookstore that sells used books, CDs, etc., I found a ton of kids' coloring books that had not been used, not even "dog ear" pages. Some had stickers with them and none of the stickers had even been touched. I know the OCC site says no used items, but I bought them anyway for about .25 each, since they were all in perfect condition. (It was cheaper than buying just a few at the Dollar store. Trying to stretch a dollar, don't you know.) When I am at the thrift stores, I look for coloring books and notebooks in great shape and occasionally find a bargain there, too. I have found birthday favor items still in bags (like someone over bought or changed his/her mind).